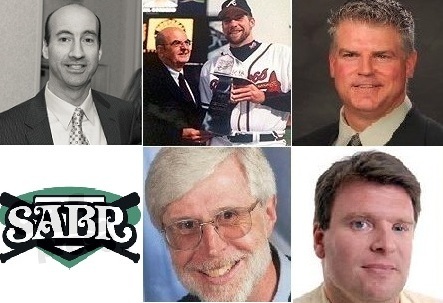 The Media Panel for our rescheduled SABR Day Event is this Sat., Feb. 7. It promises to be a very special event. The panel will include David Kull, Sr. Deputy Editor at ESPN Digital Media; Bob Wirz, former chief spokesperson for Baseball Commissioners Bowie Kuhn and Peter Ueberroth; David Borges, Baseball writer for the New Haven Register; David Heuschkel, Turley Sports Editor & former Red Sox beat writer, and WTIC Radio legend Scott Gray, who will be our Moderator. This event will include a book sale that commences at 1:30, 30 minutes before the event begins. -Wirz and Borges are Hall of Fame voters. -Wirz was for six years the publicity and public relations director for the Kansas City Royals after years in newspaper, radio and television. -Heuschkel covered the 2004 World Series & 3 other Fall Classics, including the 2000 Subway Series. -Kull manages some of the nation’s best — Jayson Stark, Buster Olney, Tim Kurkjian and Jerry Crasnick, to name a few. He has covered 10 World Series and nine All-Star Games. -Borges finished his first season on the Red Sox beat in 2004, chronicling their first WS title in 86 years. He cast his first HOF ballot in the recent voting that swept Pedro, Smoltz, RJ and Biggio into Cooperstown. -Scott Gray was a fixture at WTIC AM since 1981 when he joined Bob Steele and Arnold Dean at New England’s far reaching AM powerhouse. Gray wrote and delivered over 3,500 morning sports commentaries. His varied experience includes the broadcasting of UConn Womens Basketball including their flip-the-script defeat of Pat Summit’s Tennessee Vols in 1995.